Once upon a time you could shoot 60FPS material on a video camera and use Cinema Tools to conform or alter the properties of the clip to 23.98 (or 30 if you were so inclined). 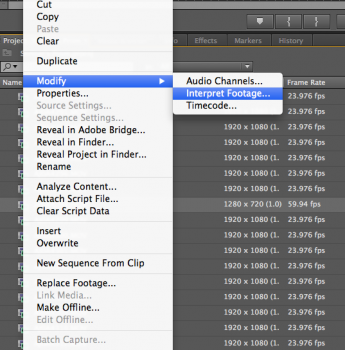 With more folks using Premiere to edit I couldn’t find the solution to do the same until I stumbled upon another blog post. 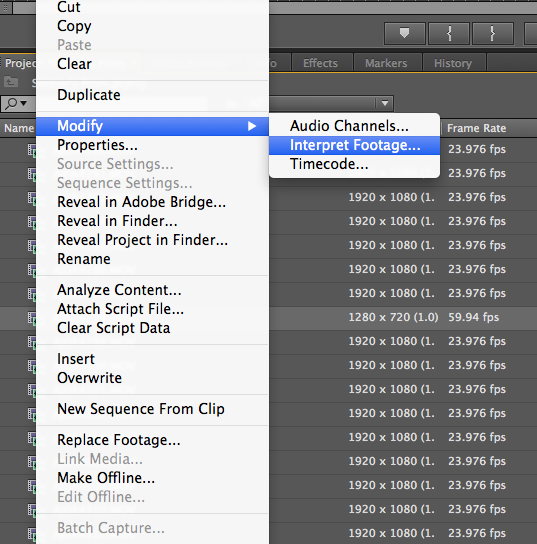 Within the project folder right-click on the clip that was recorded at 60FPS and choose Modify>Interpret Footage. In the dialogue change the Assume Frame rate box to the appropriate time base for your project. Now this does not change the size of your clip so if you recorded slow motion clips at 720 and the rest of your project at 1080 you will have to scale up the slow-motion clips or scale down your 1080 footage. Every year it is fun to play tricks on people with April fools. Sometimes the manufacturers come out with a post for new gear that seems so amazing and perfect, but just a little bit off. April fools. My favorite was this one on Facebook from Edelkrone. With NAB starting very soon new gear has been slipping out just ahead of the big announcements to get more attention. One I saw was the collapsable rail from Rigwheels. Could be cool. We’ll see if Black Magic can steal the show again this year. I also think we will see a lot more stuff for flying cameras around. Gimbals for stabilizing everything. And of course lots more 4K and beyond.